Pata tim is a popular pork leg Filipino dish which is very similar to the paksiw na pata but does this dish not have vinegar. This dish is basically cooked pork leg with a blend of soy sauce, oyster sauce, pineapple juice and spices like garlic, star anise and cinnamon and with vegetables like mushrooms and bok choy. What makes this dish appetizing aside from it’s flavor is the very tender meat and the skin with gelatin like texture and thick savory sauce. Cooking this dish seems complicated and you might think that this can only be cooked by an experienced chef. But just reading the procedure, you will know that it is that complicated at all. If you have cooked some simple Asian dishes or Filipino dishes, then cooking pata tim is a breeze. Pata tim is a popular pork leg Filipino dish which is very similar to the paksiw na pata but does this dish not have vinegar. When buying the pork leg, it is easier to prepare if you will ask the meat vendor to chop it for you about 1½ inch thick. You can also use cook the whole pork pata. Wash the pork pata in running water and soak in water for at least half an hour to remove the all the blood and to lessen the odor. Drain and put in a pot and fill with water just enough to cover the pork. Let boil until the scum floats then drain again and rinse to remove the remaining scum. Fill with water again just like what you did before and add in soy sauce, pineapple juice, garlic, star anise and cinnamon bark. Let boil and simmer for about an hour to 1-1/2 hour. Add more water if necessarily. Then add sugar and oyster sauce. Boil again for 30 minutes or until the pork is tender. Add in the mushroom and continue cooking until the skin is soft and with a gelatin texture and the liquid is reduced to half. Mix cornstarch with 3 Tbsp water and pour in to thicken the sauce. Season with salt or fish sauce to taste. In the meantime, wash and trim the bok choy. Blanch in a saucepan with boiling water for 2 minutes. Then mix the bok choy with the pata tim and serve hot. You can make it more presentable by doing this: upon serving the pata tim, arrange a bed of blanched bok choy on a platter. Then put the pork leg pieces and mushrooms on the bok choy and pour over the sauce on the pata tim. Hi! 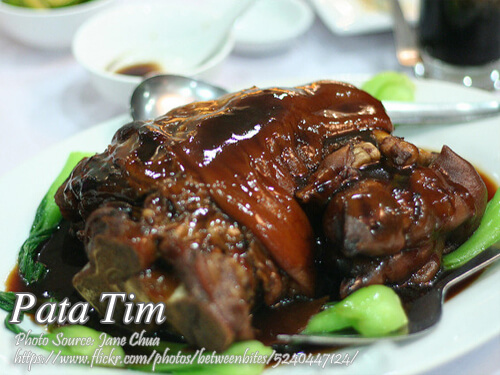 Thanks for sharing this delicious pata tim recipe. Just want to ask if I can omit the book choy. Thanks for your comment too Willy. Yes you can omit the bokchoy but be sure to include the mushrooms. I’ll try to cook this pata tim recipe tomorrow. Thanks! Hi Fely, good luck on your cooking! Will try your recipe on my birthday. Thanks. Hi Geepet, advance happy birthday! Instead of pineapple juice, what’s the alternative? Hi Ann, I think you can use orange juice. Pata tim is a yummy dish! some people include banana blossom in their recipe, may I ask when is the right time to add the banana blossom in cooking Pata tim? thank you! Hi Tintin, I didn’t know that some people prefer adding banana blossoms on pata tim. But in paksiw na pata, banan blossoms are usually added a few minutes before it is cooked.